The variety of flours now available is good news for adventurous cooks - and those who need to avoid gluten. Flour is a powder derived from a number of carbohydrate sources, of which wheat is but one. Here's a rundown of the flour varieties you're likely to find. 00 ('double zero') flour is the most-finely ground Italian durum wheat flour you can buy. It has high levels of protein and gluten, making it perfect for pizza doughs and pasta. Potato flour is gluten-free and made from dehydrated, finely-ground potatoes. Use it as a thickener for soups, sauces and gravies, or in savoury pancakes, waffles and bread. Soya (or soy) flour, made from ground, roasted soybeans, is gluten-free and available in full-fat and 'defatted' styles. Both are rich in high-quality protein (defatted soya is highest) and other nutrients. Soya flour adds a unique flavour and nutrient boost to batters, dough and bread mixes. Quinoa flour is derived from a nutritious cereal crop. With the highest levels of protein and iron of all grain and cereal flours, quinoa is a good choice for vegetarians and the gluten intolerant. Rice flour is derived from polished, broken rice (usually white) ground into a powder. It is used to make noodles and 'pastry' sheets in Asian cuisine and as a gluten-free wheat substitute in baking and sauces (note: the rice sold in a blue box is coarser). Rye flour has a sweet-sour flavour and a heavy consistency. It contains less gluten than wheat flours, producing the very dense and filling breads popular in Europe. Buckwheat flour is milled from the seeds of an ancient plant related to rhubarb and sorrel (but not wheat). It's gluten-free, with a nutty, earthy flavour popular in pancakes, pastas, porridge and Japanese soba noodles. Besan flour, made from ground chickpeas or yellow split peas, is gluten-free and used extensively in Indian cooking, adding a distinctive, nutty flavour to bhajis, pakoras, flat breads and sweets. Barley flour (containing gluten) is a high-fibre, nutritious product popular in Europe for puddings, soups and unleavened breads. Maize flour comes from ground corn kernels. In South America and the Caribbean, it's used in everything from tortillas and tamales to puddings and soups. It's also gluten-free. Self-raising flour is a combination of plain or wholemeal flours (see below) and raising agents. It's best used for cakes and puddings, or where a light, airy texture is required. Gluten-free versions are also available. Wholemeal flour involves milling of the entire wheat kernel - bran (outer layer), germ (embryo) and endosperm, and has a higher fibre count than plain flour. Plain flour is milled from the endosperm (nutritive tissue) of wheat kernels only and is graded according to its gluten content - low-gluten flour for cakes through to high-gluten flours (see 00 flour) for bread and pasta. Cornflour can refer to a wheat starch powder or a flour derived from gluten-free maize (corn), so if you're wheat-sensitive, check the packet. Use as a thickener for sauces and gravies and in sponge cakes. Spelt flour is a fibre-rich alternative to wheat flour for breads, pasta, muffins etc. While spelt starch is reportedly easier to digest for the wheat-intolerant, it does contain gluten. Unbleached flour is free of the chemicals used to extend the shelf-life and whiten wheat flour, but it can contain chemical dough improvers and maturing agents. 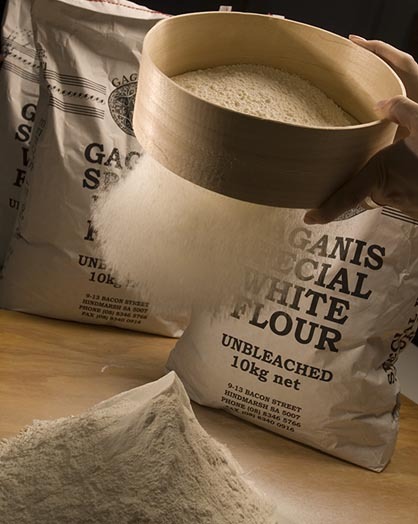 Unbleached flour has a higher gluten content and is preferred for bread making.